There are clean builds. And then there are ‘clean’ builds. Motorcycles so neat, you would imagine the mechanic scrubbing up before working on it. The latest build from Jesse Bassett and The Gasbox is one such build. A BMW special the likes of which the world has never seen, it is born of German build quality paired with American styling cues. These two opposite ideals work together to create a machine that has been built with surgical precision, and comes out looking like something the BMW factory itself would have created, if it had been founded in Ohio instead of Munich that is. Jesse Bassett is no stranger to the show scene. Looking a few years back, a testament to his skills was his Indian Scout build taking second place to Shinya Kimura in The Quail Motorcycle Gathering. Like Shinya Kimura, Jesse has produced his own style. Although it’s hard to pin a category to place his bikes in, except as customs, Jesse’s bikes are still appealing to the eye and to the heart. 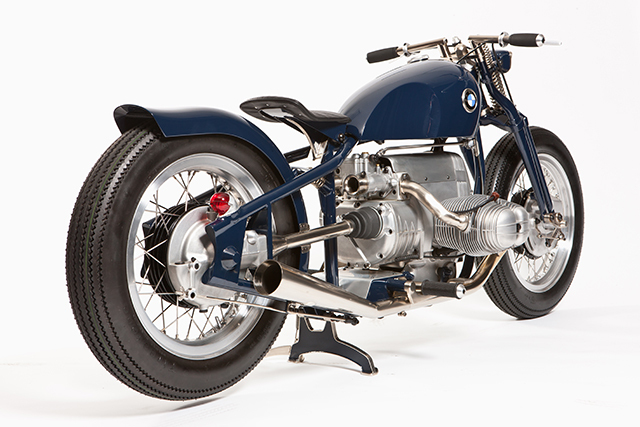 Taking the engine from a 1983 BMW R80, Jesse fabricated a hardtail frame of proportions to suit the boxer engine. 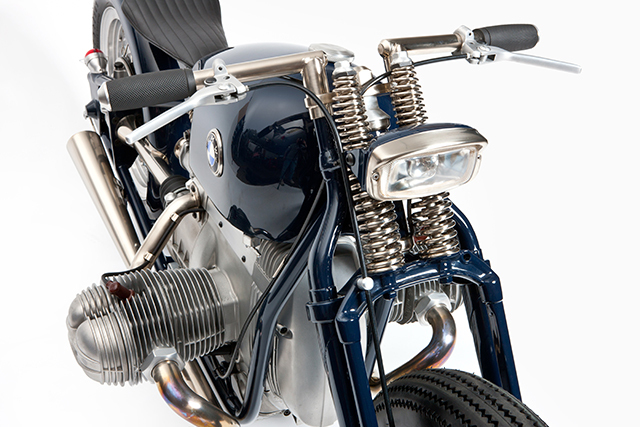 The ability to manufacture componentry for the bike inhouse at The Gasbox was a benefit in the build, allowing to Jesse to produce the parts as he saw them in his head. To give that low slung look, the frame neck was manufactured to take a Harley Springer front end. The extra rake, along with the design of the rear frame, allows for the bike to have that low slung look. This is even while riding on fat Firestone 18 inch tyres. To ensure the smooth flow of the lines of the bike, he took it upon himself to produce some of the major componentry himself. The handlebars, sitting low on the Springer fork, are mounted with a mix of Panhead and Gasbox handcontrols. 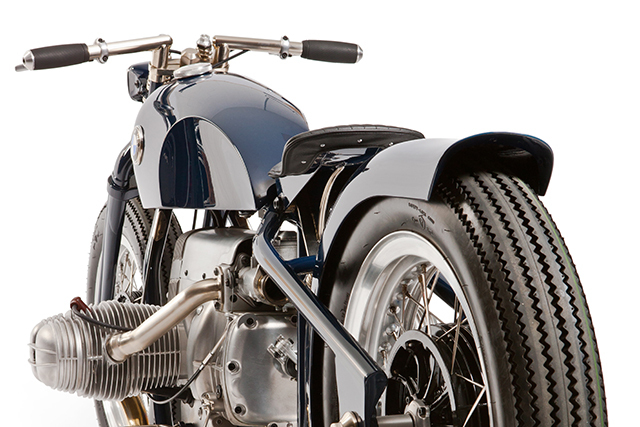 The fuel tank follows the lines of the frame nicely, with the sides scalloped to give that bobber style riding position. 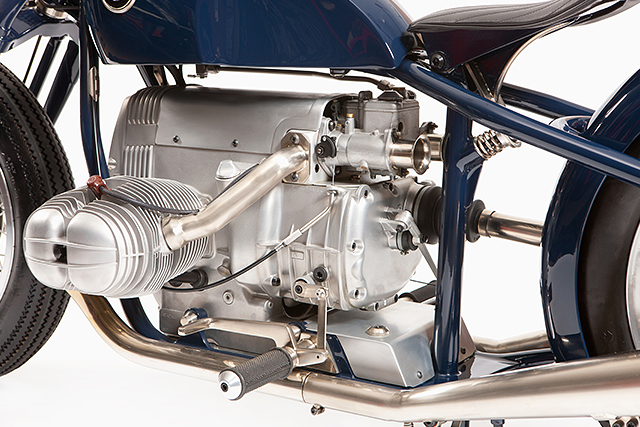 The seat pan is an Aluminium Gasbox special, trimmed by Union Speed & Style, the whole setup sprung from the centre upright to allow some reprieve for the rider’s kidneys. 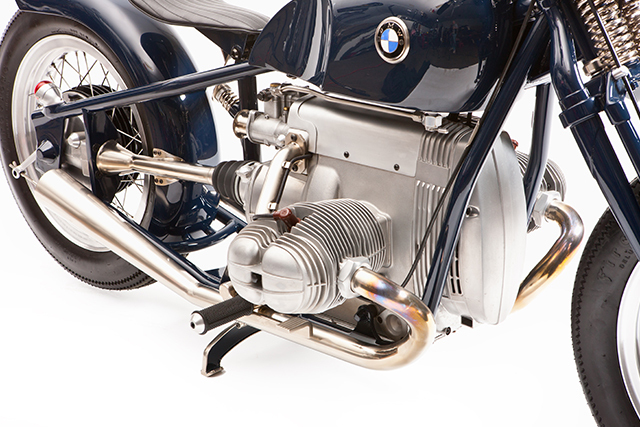 The engine utilised on the build is standard BMW R80, matched to a five speed from a later BMW R100R. A sweet touch is the Weber side draught carburetor used in the build, it’s angular appearance fitting in with the slab sided aesthetic of the engine. Custom manifolds make up the intake and exhaust systems for the engine, with Jesse ensuring the lines of the bike were kept neat by kicking up the silencers at the rear to follow the frame up towards the rear hub. The quality in this build shows in the fitment of the wiring harness, as you can’t see in the photos. A custom frame allowed for a custom harness, hidden way where it won’t take away from the viewing pleasure of the machine. At the front end sits a GasBox Foglamp, at the rear a Greeves tail light unit. The more you look, the more you can see how much effort Jesse put into the bike, like the production of the footpegs and foot controls just for this build. Taking a thirty year old engine, and cloaking it in a frame of his own devising, Jesse and The Gasbox have produced one of the cleanest bikes out on the show scene. Don’t be mistaken though, this bike is ridden, and ridden hard. As Jesse himself says: The bike sounds like an F1 racecar, it goes and handles terrific. In fact, on my first ride I actually scared myself with how fast it was’. 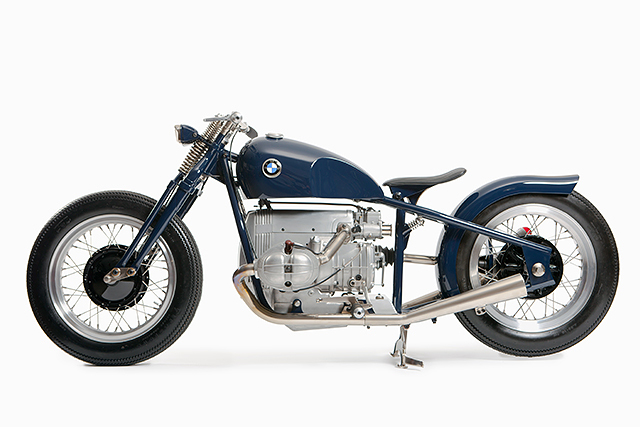 With no real style category to place it in, the bike’s look is timeless. 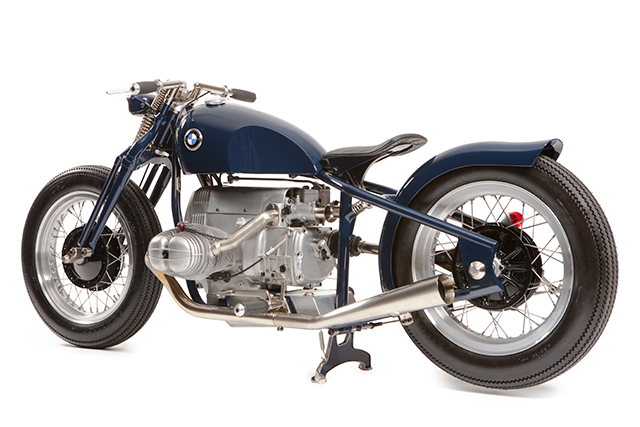 It would just as much be at home in 1954 as it does today, it is a bike for the ages.